Common Size: 10 inches and 1 pound. Food Habits: Primarily feed on threadfin shad, young gizzard shad, blueback herring and insects. 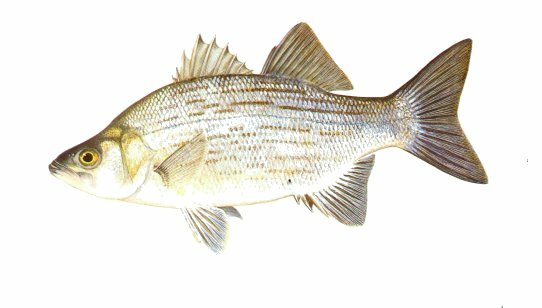 Spawning: The white bass migrate upstream from reservoirs during March and April as water temperatures approach 55°F. Males and females congregate in shallow areas of the stream where up to one million eggs are released from a large female and fertilized. These adhesive eggs stick to trees and other substrate where they hatch unattended after approximately 45 hours.